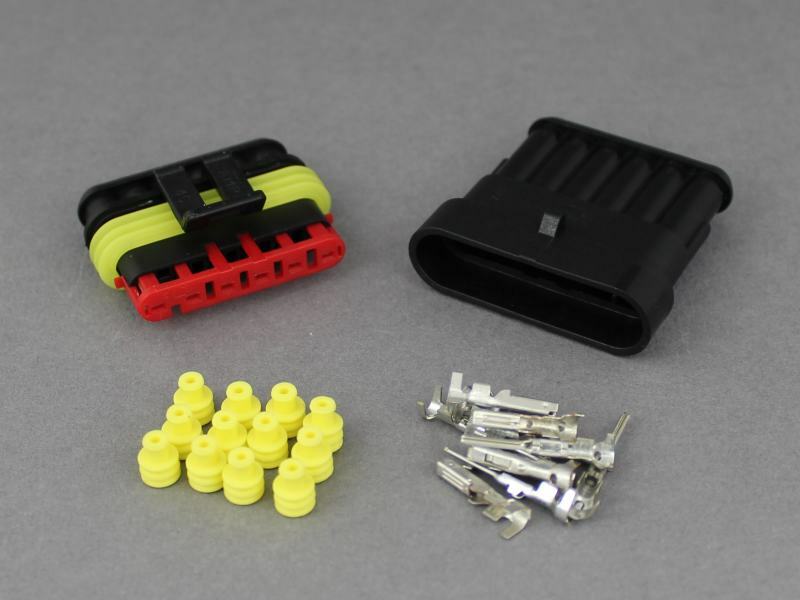 6-Way Superseal 1.5 Series compact, high quality connector designed for auto and marine applications where a water-tight seal is required. Their reliability under harsh conditions is well proven and they are particularly suited for use in engine bays and other aggressive environments. Suitable for cables from 0.5 - 1.5mm². Male tab and female receptacle terminals are crimped onto the cables and then inserted into the the connector housings. A secondary lock ensures that the terminals are properly located (lock cannot be closed unless terminals are fully seated) and prevents them backing out of the housings. Note: Male tab terminals fit into the female connector housing and vice-versa. Sold as a male/female pair complete with all terminals and cable seals (spares available - please see further information). Assembly tip: The rubber cable seal should be crimped within the rear part of the terminal to retain it in the housing. Ensure that the terminals are not deformed before inserting into the housings. It is sometimes necessary to use a pair of long nosed pliers to pull the terminals fully forward before closing the red secondary locks.